Not a paper, but. . . . . So this. . . . .
is my life for the next couple of weeks. It’s a buttload of debitage. Bet you didn’t know I was a lithic analyst, huh? However, since I was the most qualified among us — because, you know, I did a small debitage analysis project 25 years ago — I was tasked with it. So far it’s going rather well. I did the tools already, which were mostly broken half-finished bifaces with a few utilized flakes thrown in (plus a couple of nice projectile points), but the main thing is the debitage since that makes up like 99% of the objects. Did I mention it’s the major analysis for the project? Ya, no pressure. Anyway, it is going rather well, although I’ve been really nervous. Because, you know, the last lithic analysis I did was a small debitage analysis project 25 years ago. 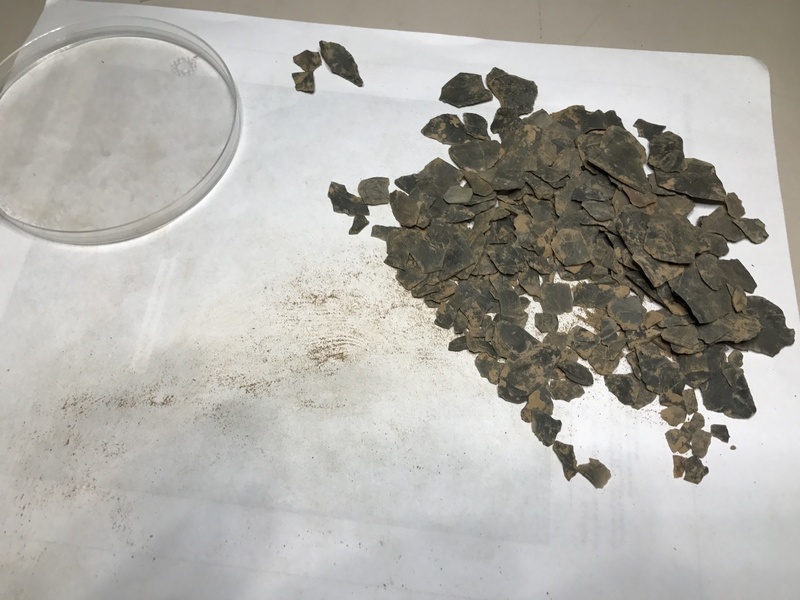 But it’s a pretty simple analysis and the great thing is that it’s 99% a single raw material (chert) and it’s predominantly one thing: broken flakes from biface manufacture. Probably the best scenario to get back into it. Pretty much basic sorts of data: count them all up, and then take a sample and do metrics and record other traits (number of flake scars, platform shape, etc.) for each flake. I’m starting that stuff tomorrow. (Probably). I have to analyze about 1500 individual flakes. Can you say Tedious? I knew that you could.